According to Mean-Value Theorem (MVT) in Calculus, "There is a point $c$, such that $a < c < b$, at which the tangent line is parallel to the secant line through $(a,y(a))$ and $(a, y(b))$". I have these 2 graphs and which do not conform to MVT. I have my reasons here why they do not, I want to know if I am correct. Red lines are $Secant-Lines$. 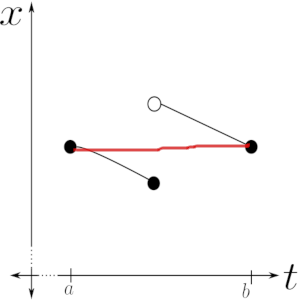 It can be easily seen that graph-1 has asymptotic discontinuity and graph-2 has jump discontinuity. 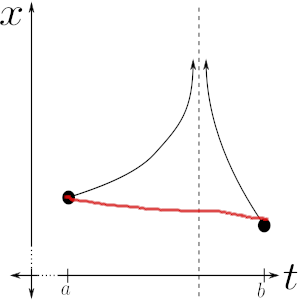 Secant lines are red and there can be drawn not one tangent line that is parallel to the secant line in both graphs. Hence, MVT is not applicable . The MVT requires the assumption that $f$ is differentiable in $(a,b)$. Your examples show functions with infinities or jump discontinuities. These are not even continuous, so clearly not differentiable. Is the derivative an approximate value? How to prove that a function is above a its tangent line using the mean value theorem? If Rolle's Theorem is assumed to be true, doesn't that prove the MVT?